Below are opening statements we have given at trial in civil injury cases. The PDF files are actual trial transcripts from trials, including a number of million dollar plus verdicts. We also have a draft opening statement further below. Our firm has a history of getting exceptional results for our clients at trial. It all begins with the opening. There is a new school of thought about the best way for plaintiffs' counsel to present an opening statement. It would be nice to pretend we invented this format. But our approach is liberally stolen from Don Keenen (Reptile), David Ball (Damages and Reptile), and countless others. 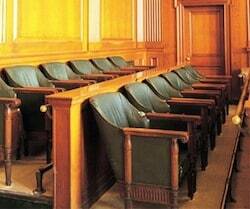 These example opening statements give lawyers ideas on how to approach a jury trial. You can find sample closing statements here. Below are PowerPoint presentations from an opening in a case we tried in September 2013 in which the client was awarded $5.5 million and another in May 2014 where the client was awarded $5.2 million. The first is a little truncated because we took out much of the good stuff because we do not want to name the plaintiff or the doctor. The PowerPoint had tons of deposition clips and we did not wish to put the doctor and his experts videotaped depositions on-line. On the second PowerPoint, we sought and received permission from the client to post his material online without redactions. For the $10 million jury verdict in Baltimore City in 2016, the client -- who won a civil justice award in 2017 from the Maryland Association of Justice -- graciously agreed to allow us to put the entire opening statement and PowerPoint #3 online to help other attorneys without any redactions. We are giving high-tech openings that give the jury a chance to understand the evidence. It is very effective in communicating to jurors information in the manner in which they demand it in 2019. Defense lawyers are now trying to stop us from showing the jury what the evidence will show by filing motions in advance. We usually win this motion without qualification. The law and common sense are so much on our side it is ridiculous. But defense counsel is fighting these hard and we have to be ready to show the court what the law is. Juries expect a high tech presentation in 2019. Give it to them. But use technology to show them the evidence. Show the evidence you plan to use: deposition testimony, medical records, documents, etc. Don't use PowerPoint and just give them an outline. That said, please don't overuse the phrase "the evidence will show." In fact, don't overuse any phrase. The time to sprinkle that in is if you are about to say something that you arguably should not say in an opening. Don't write checks you can't cash. Tell them what the evidence will show. Don't oversell the case you have. Don't begin advocating until you are more than halfway through your opening. Just give the facts neutrally. You have to develop credibility with the jury before you start to point fingers. Educate the jurors about the case. Juries appreciate lawyers that provide real information to them that they can use. Save your long speech about how grateful you are for their service. Jurors want to do their jobs correctly and go home. They don't care about your gratitude and it almost invariably comes off as hokey. Explain the case to the juror like you would try to explain it to a friend. Save the big words and the pomp and circumstance. Don't tell the jury you are giving them a road map. No one says, "Oh goodie! A road map!" Just use this first chance to talk to the jury to tell the story. Begin by telling the jury the simple rule that would be applied to the case. Jurors are worried they won't be able to do their jobs because they won't understand it. This rule reassures them that there will be a clear road to make their decision. Bonus Tip: read this book. Then read it again. Every lawyer has a different process for preparing an opening. My process for an opening statement is to spend no more than an hour or two writing it out as if I was required to write a transcript of the opening statement. I read it out loud to myself, and then I make a shorter handwritten outline, never looking back at the original draft. I never even bring the opening statement outline to trial - it is all just a process. I think when lawyers draft out a script and stick with it, their presentation is too canned, and they are no longer having a real conversation with the jury. The opening below is patterned in some measure after David Ball’s suggested chronology of an opening statement (with modifications we have made consistent with our practical experience and the specifics of that case). (Thoughts on how to begin) - the biggest key here is to make the small talk brief and get right to it. II. What are the Rules? The defendant is Maryland Machine Contractors. The testimony you are going to hear is going to be complicated at times. But the rule you are going to be asked to apply by the judge is a very simple rule: Did Maryland Machine build a mechanical system that was defectively designed that lead to the death of Cindy Manning? In 2013, the defendant Maryland Machine built a Machine system at Crawford Sugar Factory. This is an exhibit of what they built. Now, if you have lived in Baltimore, you have almost certainly seen the Crawford Sugar sign at the Inner Harbor. The factory has been here since the '20s. But the system at issue was redesigned in 2013 and built by Maryland Machine. The system is in a place called the Wash House. In the Wash House, a hot, chemical slurry is used to begin to convert the sugar that comes out of the fields into the sugar that you put in your coffee. So Crawford Sugar says to Maryland Machine, we want to re-do this area of the Wash House, here are some drawings with our idea of how we think it should be built. And Maryland Machine said okay, we will build you a system. This is the 2-3-8 tank. It holds approximately 5,000 gallons of hot liquid slurry. As a part of the beginning of the refining process, raw sugar is pumped through pipes into this 5,000-gallon tank where it is combined with lime and carbon dioxide resulting in a hot liquid slurry that contains calcium carbonate. This solution is heated to 160 to 185 degrees. Now in this tank is raw sugar and these chemicals but also a lot of junk: rocks, wood, debris, you name it. And it all comes down this pipe and into this strainer and then it gets sent up for more processing. This right here is a valve that you can turn on and off to stop the flow. So if you want to service the strainer, clean it out or whatever, you need to close this value. And then there is a little valve at the bottom of the strainer right here, then a small valve at the top of the strainer right here. If the slurry has been drained out of the system, the Earth System’s Operator – that is what this job is called – removes the 15-pound strainer cover and pulls out the strainer basket, cleans it out and starts over again. That is the regular cleaning process or if the system is clogged by a full filter. Now, what if the system itself was blocked in here in the pipes as opposed to the strainer? The operator would not know the difference. This situation creates a risk for the unexpected release of stored energy that could cause injury to employees, which is what happens here. One night, Cindy Manning arrives at work and found that the system she was working on was clogged. Being a new employee, she calls her supervisor; a gentleman named Joe Rivera and asked for help. Mr. Rivera asks Henry Taylor to help who in turn asks Mike Foster to assist Cindy in unclogging the system. You are going to have the opportunity to meet Mr. Foster. Foster is an important witness because he is the only living eyewitness to the accident. Mr. Foster goes and sees – as he was told to expect – that the 2-3-8 Strainer is blocked. So he did what he was supposed to do, what he was trained to do. He shut off all of the valves that could bring about an unexpected release of the hot slurry, and he takes off the lid to the strainer. So Mr. Foster tries to stick a rod up to clean out the blockage. Then he attempts to squirt some water. Nothing worked. So they stand there talking, trying to figure out what to do next. Suddenly, hot slurry heated to between 160 and 185 degrees comes down on Cindy Manning. She tries to escape, but she falls. When she gets up, she is covered in this hot chemical slurry. IV. What Were the Immediate Harms? (sticking just to the immediate harm for now). After six days of unimaginable suffering, Cindy Manning died. V. Who Are We Suing and Why? After the accident, Crawford did an investigation as to how the accident could have been avoided. A week later, Crawford issued a report on the accident because they wanted to find out how the accident happened and how it could be avoided in the future. A lot of smart and qualified people with years of experience looked at this question and came to a conclusion as to how this accident could have been avoided. While I suspect none of you are plumbers, engineers, or pipe fitters, I bet if I gave each of you five minutes with this question, you could figure out how Cindy Manning’s death could have been easily avoided just as the folks at Crawford’s did. The report said that there should have been a valve right in front of the strainer. And had that been there, Cindy Manning’s life would have been saved. That hot slurry would never have come out if Maryland Machine had put a valve in front of that strainer. The minor expense of setting that valve (showing exhibit) in a way that protects Cindy Manning from those hot chemicals. Now AFTER the accident, Crawford did what should have been done in the first place – they put in the valve that would have saved Cindy Manning’s life. But at that point, it was too late. You are going to hear more on this from Dr. David Donahue. Dr. Donahue served for 15 years as the chairman of the Machine Engineering department at the University of Maryland. Now, he spends his time working for the Navy in fighting against terrorism. While the engineering needed to fight terrorism is probably a lot more complicated than the issues, in this case, Dr. Donahue will tell you that it is not at all complicated, the need for this valve was a simple thing that anyone should know. Dr. Donahue is also going to talk to you about pressure gauges and how cheap they are to install and how they would have helped provide information that would have prevented her death. You are also going to hear from Lee Tompkins. He is going to tell you the same thing as Dr. Donahue – that putting a valve here before the accident was simple common sense that any reasonable plumber or installer should have known. You are also going to hear from Dr. Henry from Johns Hopkins. He is going to tell you that this accident at Crawford caused Cindy Manning’s death. He is also going to tell you that it does not take much of this slurry on your body to cause grave pain and, ultimately, death. You are going to hear from an economist who is going to tell you what Cindy Manning’s lost wages were over the rest of Brenna’s life. You are going to hear from Cindy Manning’s family. They are going to give you an idea of what her death was like. Finally, and for your purposes, most importantly, you are also going to have the opportunity to hear from Michael Foster, the only living witness of the accident. VI. What is Wrong with the Defense? Crawford Sugar’s defense is actually very simple: Michael Foster, the man who is the only living eyewitness to this accident, is a liar. That is their case and it is illustrative of how they see these facts. Under almost any scenario you can imagine, putting this obvious valve in saves Cindy Manning’s life. There is only one theory that can be offered to argue that putting in an additional valve wouldn’t have made a difference because one of the employees was misusing the equipment. So here is the theory you are going to hear: Mike Foster chose to use a dangerous procedure in his effort to clear the elbow and the strainer. After the accident, Crawford does an investigation. And they issue a report. And the report essentially says that it was the operator’s fault. But let’s take a look at this system. I don’t think any of you are plumbers, engineers, or pipe fitters. But if I give you the project of how you isolate risk from this elbow when working on this strainer, I’ll bet all of you would figure it out within 5 minutes. Put a valve right here. Then you can safely work on the strainer. That valve would solve two problems. One, it would protect against the risk of the elbow. Second, it would protect against any problems with this valve here. This valve, called a foot valve, is closed with a chain. You need to know that the stem is closed by looking at it visually. And on the chance that something is stuck in the valve, it will seem closed when it is not closed. But there was no valve here before the accident that took Cindy Manning’s life. But Mike Foster did not do that. He will testify at this trial and tell you exactly what he did. They take Cindy to the Johns Hopkins Bay View Burn Center. It is Friday, July 28, 2011. She is suffering from first, second, and third degree burns that are made worse by the horrible chemicals in the slurry. When her sisters arrive at the hospital, they find their sister Cindy in tremendous pain. Her sister Colleen Jones notices that huge pieces of skin are hanging off her body. You would think that they would give her immediate pain medication but they could not give her anything for the pain initially until they were able to ascertain exactly what kind of chemicals were in the slurry. The next day, she was able to get pain medications but they were not having much of an impact. She’s put in this special bed for burn victims that make you feel like you are falling so Cindy feels compelled to move, making her burns worse. So she just lies there in bed, in great pain with an incredible desire to move around. In fact, the desire to move was so powerful that Cindy had to be held down with restraints. She’s burning up, she’s dying of thirst because they cannot give her water, and now they have to restrain her. You hope when you go to the hospital you get better. Cindy Manning got worse and worse. On Monday, she was with her sister and had an itch on her face, she scratched it and a huge chunk of her skin came off. Because she was in so much pain, her sisters ask the doctor to give Cindy more pain medication. The doctor tells them that if they give her any more morphine, she might forget to breathe. On Tuesday, the doctors operate on Cindy to try to save her life. The next day, Tuesday, the nurse comes to take her to surgery. The process of moving Cindy is so painful. She resists and it takes several nurses to hold her down. But the doctors tell Cindy’s family that she will be in a virtual coma after the operation because of a number of painkillers and sedatives they were going to give her. This brings some relief to the family because she has been suffering so much. Unfortunately, after the operation, Cindy is wide awake and in more pain than ever. She has tubes running down her throat,. The IV has been placed into her neck because they can no longer find an adequate vein anywhere else on her body. Her blood pressure becomes elevated. They take her off any pain medication. So her pain that was unbearable now rises to a new level. And the fluids they are pumping into her now go directly to her tissue. Her whole body swells to the point where her nose splits apart. She is biting so tightly on the breathing tube that the nurse has to tell her to stop or she will lose her oxygen supply. At some point, she is becoming unrecognizable to her family because of the swelling. She realizes she is going to die and refuses to see her daughter, not wanting Deanna’s last memory to be of her mother this way. By Thursday, her once healthy organs begin shutting down one by one. Her last words are, not surprisingly, “It hurts.” And, mercifully, she dies. This one I never bother to plan because I think the conclusion comes straight from the heart - so I don't even plan to plan. But I read David Ball on Damages (now "Damages 3") before every trial and I tell them how much money we are seeking.